Just to be clear: this is not a book review. 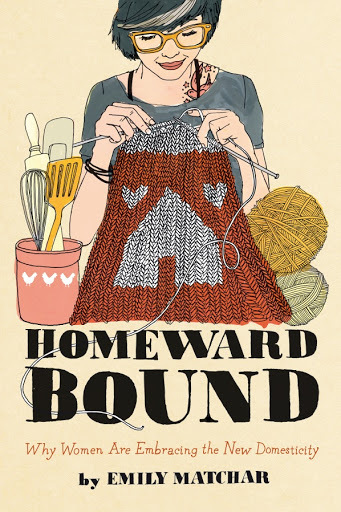 Yes, these thoughts were prompted by Emily Matchar’s Homeward Bound: Why Women Are Embracing the New Domesticity, but my main point is not to try to provide a balanced summary of the book itself. Let me just say that I found it mostly engagingly written and well researched, and I think it provokes some sobering and healthy reflection on gender and (to a lesser extent) class dynamics within the culture of earthy, homesteading DIYers. At the same time, something about the book really bothered me. I couldn’t tell if it was the author’s often sarcastic undertone as she portrayed the “New Domesticity” movement, or the fact that she presented a side of the movement that I don’t particularly (want to) identify with. You see, on the pages of this book, someone like me can easily find versions of her own self. The book is about why women — particularly white, liberal, highly educated women (check, check, check) — are embracing a subculture that celebrates the very domestic arts that earlier generations of women fought to free themselves from. Matchar focuses on the world of crafting and cooking blogs, Etsy businesses, the DIY food culture, natural parenting, “opting out” of careers, and homesteading. I don’t have an Etsy store, I continue to work a full-time job, and I am not yet a parent (although soon will be). But in most other respects, I fit perfectly the stereotype that the book evokes over and over again, in a slightly sardonic tone: the chicken-keeping, sauerkraut-making, tomato-canning, earth-loving, bike-pedaling, wool-spinning, blog-writing New Domestic. At the same time, this piling on of exaggerated stereotypes (though entertaining to read) obscures some of the truly urgent and morally compelling motivations that lead many of us to this way of life. If the movement is about re-creating the perfect 1950s suburban housewife — complete with cupcake-baking and a vintage-style Anthropologie apron — then yes, we certainly have to ask what is happening to feminist goals, but that is not the movement I see myself (or most people I know) being part of. If I was lured into this life by some role model or ideal, it is rather the badass farmer or resourceful urban homesteader or creative permaculture designer — of whichever gender — in overalls and muddy boots cultivating life in all of its forms and trying to do his or her small part to reduce the mindless waste and consumption that is built into mainstream American life. Although Matchar mentions environmental concerns as one of the reasons that motivate the “New Domestics,” I simply don’t think she takes this impulse seriously enough. I also don’t agree that this home-centered life is an apolitical choice, that by “doing it yourself” you cease to try to change the system for the better. It is through activities such as cooking from scratch and preserving food that the local food movement, and small farmers everywhere, are being supported and the irresponsible, jet-fueled processed food industry challenged by a viable alternative. It is by developing self-sufficiency — learning to produce more and more of one’s daily needs oneself, whether it’s sewing a button or fixing an appliance or growing vegetables — that one can begin to make a small but important dent in the monstrous machine of consumerist culture and throw-away goods. It is by being more present to one’s children and involving them in these activities that one can foster future decision-makers who are capable of questioning what mainstream culture tells them to do and want and dream. It is by engaging in all these activities that people around the country are standing up as examples and inspiring each other. The “New Domesticity,” as I see it, is every bit a political choice. Just my two cents. I’d welcome any thoughts any of you might have! But you might as well enjoy yourself while you’re at it 😉 ! This is a really good read, thank you 🙂 The decision for me to give up work earlier this year had nothing to do with aspiring to go back to a 1950’s model of house-wifery but everything to do with trying to attain a better quality of life – better food, a slower pace doing what’s really important to us and yes, a fight back against consumerism and mainstream culture …. what we have been taught to aspire to. I have just applied for a full time job and if I get it my husband will stop working for a while in turn. He in fact has more skills than I that can be utilised here at home. We are not chasing money but a better standard for living and I am so happy to see so many others feel the same way. An interesting read that will appeal to many who read this blog and others like it. Thank you Gather & Grow. Thank you — I’m glad you liked it! I came to your post via Quarteracre Lifestyle and I think you have said it beautifully – for most people the resurgence of the ‘new’ domesticity is a political statement. It is taking back control in a situation that is out of control. Monsanto’s arm reaches far beyond the shores of the US and while Americans remain the ultimate in uber materialism, much of the Western world aspires to follow them to their materialistic utopia. Thanks for your thoughts. I think it’s one of those quiet revolutions that don’t seem much like a revolution from the outside, and as many people don’t see the connections between small daily actions and the larger systems, they might miss what’s going on. I’m counting on it to spread like rings in water. Until it can no longer be ignored. Silent revolution! Mari, well said. I refused to learn any skill that was classified “woman’s work” when i was young. I wanted a career and to be outdoors. I was a tomboy who worked on cars and played with snakes. Why would I want to sit indoors ironing and learning to sew. I came to realize there is more to these skills than I gave them credit for. I do the things I do, growing food because I get to play in the dirt and i have control over my food, I diy and have learned to sew because it allows me to avoid shopping and supporting practices I don’t believe in. But never would I say my reasons have anything to do with trying to recreate the household of the 1950s. Maybe we should not call it ‘domesticity’, since this word is laced with such a negative connotation, but rather ‘common sense’ or the ‘natural order of things’. To learn how to do most everything for ourselves, not being completely dumbfounded by even the smallest tasks and having to purchase goods and hire services for everything that is needed, gives us a sense of control over our lives. This autonomy in turn liberates us from the shackles of dependency on corporations and other opportunists. I really don’t think that human beings are meant to be educated and trained for the sole purpose of becoming lifelong employees and consumers without being able to do as much as sew on a button, cook a healthy dinner, make some handmade gifts, mend a ripped seam, repair a broken toilette flusher mechanism, or grow and preserve some vegetables, fruit, and herbs. The more practical knowledge and skills we acquire, the more independent we become, and the better we can direct our own destinies – regardless of our gender. Common sense. I like that. I hate the new trend to put down the women who came before us; titles of articles like “not your mother’s cooking”, “not your grandmother’s knitting” and so on. Why can’t we be innovative without slamming our foremothers? (and forefathers in some cases). I love when I knit or crochet or sew (whether I’m making something traditional or inventing something) that I am connected through my handwork to all those women I never knew, but who form a line reaching back from me into the mists of time. I LOVE it!! My grandmothers knitted every time they sat down to provide mitts, socks, scarves and sweaters to keep their families warm. If they weren’t knitting, they were darning socks or mending clothes (when’s the last time you saw a well-sewn-on patch on someone’s clothes? jDoesn’t go with the waste of a money-based culture, does it?). Or they might be crocheting a doily or lace curtains to make their home more beautiful and to also express their creativity. My Mum raised nine kids; she baked all our bread,cakes, cookies, pies, etc. She canned (preserved) fruit, pickles, relishes, etc. every summer. She grew large gardens to feed us. She cooked on a wood stove for years, started the furnace in the morning, did laundry by hand until I was 10 or more (with half a dozen kidsd to wash for, too!) And she wrote poetry and had it published in magazines and papers, did volunteer work later on, taught several of us to read by age four, and a lot more. She went without so much so that we could have more and never once has complained or thrown it back at us. I don’t know why people identify ‘domesticity’ with US 1950s tv shows; there is so much more to women’s work and contributions to the world and society than what was portrayed then. Life for us and others like us was not about pearls, twin sets and tea aprons; it was about making a real life with your husband and kids; about finding your own ways of expressing your gifts and talents. We never had tv and I chose not to have one after I grew up; but I did see some of those shows at friends’ places. They bore no resemblance to the world I knew, of women (and men) who worked hard, were creative with it, and were proud of what they accomplished. Well, this is pretty long. But you sparked something that runs very deep in me and I wanted to add my point of view. I’ve worked in offices and stores and believe me, they offer nothing compared to the satisfaction of home-making in the traditions of my own people. At least not to me and women like me. I’m fine with people making other choices; this isn’t a one-size-fits-all sort of world and women do other valuable things, too. But I wish they would stop slamming those of us who are happy to keep the traditions going (and to start some new ones, too). I’m not a ‘women’s libber’, either; I’m a ‘human libber’. I feel we all have much to learn about living together on this earth and about how we treat the earth itself. Not to mention about expressing our creative side instead of only watching pictures of others doing so. We are capable of so, so much! I forgot to add that women up to my mother’s generation had their children at home; the travesty of modern childbirth began after the War. I am grateful that is changing now. Thank you, Linne, for sharing your perspective, and adding these points about earlier generations to the conversation. I too cherish that sense of connection to those who came before me that comes from engaging in certain acts and movements of the body, like kneading bread or spinning wool. I actually clapped right here at my computer, when I read your comments! Well said! I have often wanted to shout my feelings about the trend of calling books, etc. “not your grandmother’s quilting” or whatever. It always makes me so mad! I am 63 years old now, and when I was young and learning how I wanted to live my life, I looked to the women and men who came before me, my elder family members and friends and neighbors, as well as to books like The Foxfire Books, Celestine Sibley’s books, and Tasha Tudor, to name a few. There was a shop in Atlanta back in the early 70’s called “Granny Taught Me How”, full of supplies for quilting, crochet, and knitting, and inspiration. That’s more like it! Thanks for this reflection. I agree with a lot of what you say, though I would add that I am a bit tired of the media over-emphasis on white, liberal “new domestics” or “femivores” as Peggy Orenstein describes them. Poor and working class women and women of color have been recycling, farming, cooking, sewing, etc., forever, but they are not touted as exemplars of a “new” movement because they are understood as doing this out of “necessity,” which stands in stark contrast to the liberal valorization of “choice” and “agency.” I, for one, would love to hear stories by and about women who do not fit the “new domestics” prototype, but who are “doing it by themselves” and, in turn, are challenging assumptions about this movement and about what constitutes political acts. Well said! I would like to see that too.